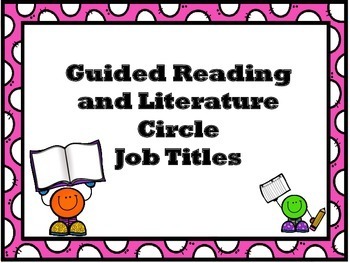 This resource includes 8 different literacy jobs and coordinating descriptions that can be used during guided reading, literature circles, literacy centers, small, or whole group instruction. Students use these job descriptors to respond to any piece of text in a discussion format. This activity allows for an interactive, organized discussion centered around a text. Jobs include: The Connector, The Summarizer, Artful Artist, Genre Guru, Word Wizard, Vocabulary Valet, The Questioner, The Summarizer. These job descriptors help to organize the conversation, while allowing everyone to be engaged and participating. 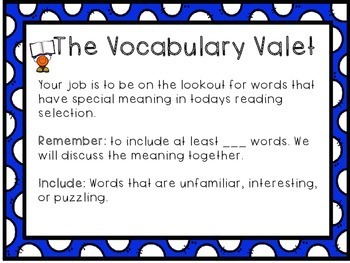 This resource is great for differentiating and can be a wonderful resource to use in Daily 5 or Readers Workshop. Laminate for durability. 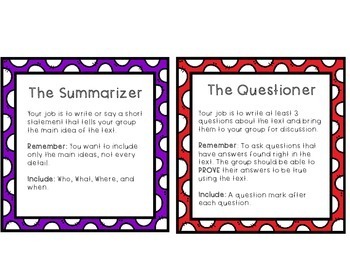 8 Large posters to be displayed or to be used as an anchor chart/modeling. 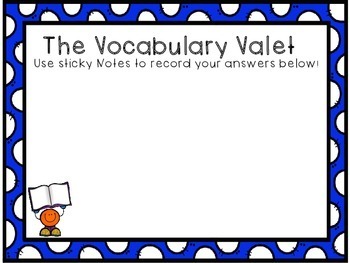 8 activity mats-students use sticky notes to respond to text. Great interactive activity! 1 Reading Job Spinner-a fun way to choose jobs! 1 Reading job tracker- keep track of the dates that students complete each reading job.